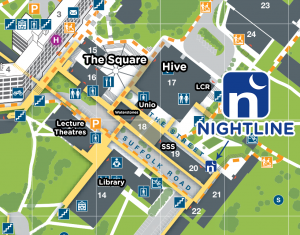 Norwich Nightline offers a totally confidential and non-advisory listening service for UEA and NUA students. We don’t lecture or judge our callers, our job is to listen and help them reach their own conclusions. Whether you want to talk about something that’s upsetting you or one of your friends, or want some information of any kind, we are here to listen. No problem is too big or too small. We are simply here to listen. We are available 8pm to 8am every term time night on 01603 597158. Drop in: Nightline Office, Student Support Centre (See map, click for full size). We offer drop in callers tea, coffee and biscuits. We can also give out condoms and pregnancy tests via the C-card scheme. If you are unable to get through to us for any reason, please check our Twitter or Facebook pages for any urgent service announcements. The small print: All calls and texts are charged at standard network rates. Skype calls are free. We do not record calls of any kind, even for training purposes. Callers should not contact us via Facebook, Twitter or Instagram and instead use any of the methods listed above. Whilst we share the same building as the SSS, we are a separate organisation run by student volunteers, not the university. For details on how we handle calls, please read our policy page.